'Star Wars: Women of the Galaxy' Book Announced! Women of the Galaxy cover by Jen Bartel. Lucasfilm announced a new book celebrating the female characters of the Star Wars galaxy today! 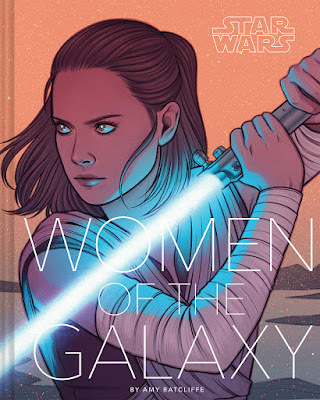 The book, which is titled Star Wars: Women of the Galaxy, is written by Amy Ratcliffe and features art from eighteen female and non-binary artists. Women of the Galaxy will highlight seventy-five female characters from across franchise, including film characters like Rey, Padme, Rose, Leia, and Jyn, to the animated projects with characters like Ahsoka Tano and Bo-Katan, and characters introduced in publishing like Rae Sloane and Vi Moradi. "With Women of the Galaxy, I want to celebrate female characters across the galaxy — from the ones fans know incredibly well, like Leia and Padmé, to lesser known women like Vi Moradi or Aurra Sing. The characters in the book have a range of alignments, professions, and traits, and they all offer so much to the universe. Every one of them is important. I think of the entries as being part celebration and part bio, with background information about the character, behind the scenes facts, and key moments that resonated with me. My hope is that fans of all ages will find inspiration from the characters in the book and maybe be encouraged to explore more stories set in the Star Wars galaxy." The eighteen artists featured in the book are, Alice X. Zhang, Amy Beth Christenson, Annie Stoll, Annie Wu, Christina Chung, Cryssy Cheung, Eli Baum, Elsa Charretier, Geneva B., Jen Aberin Johnson, Jen Bartel, Jenny Parks, Karen Hallion, Little Corvus, Sara Alfageeh, Sara Kipin, Sarah Wilkinson, and Viviane Tanner. Star Wars: Women of the Galaxy is slated to hit book store shelves in October. Except they ignore the women who should be there. Put Jaina and Mara and Bastila and Nomi and Meetra and Satele in.